Now in paperback, this full-color resource demonstrates how to create extraordinary effects with a few basic embroidery stitches. Information on tools, materials and stitching, 22 basic embroidery stitches with left handed versions, 110 stitch variations, 160 combinations shown worked in thread, eight techniques for creating your own combinations, and fifteen ruled pages for you to collect your stitch ideas. All in a 5 x 8 inch size to keep handy in your stitching basket. 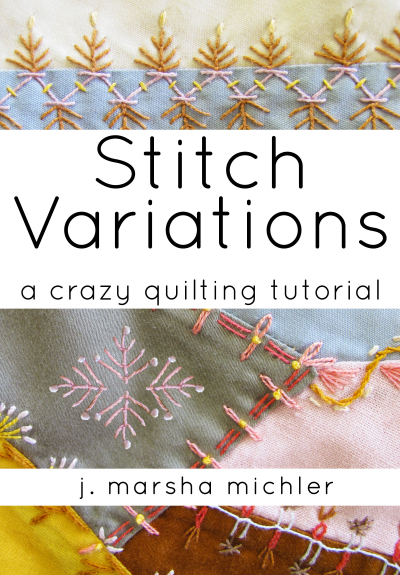 An expanded and enhanced version of the two eBooks, Stitch Variations for Crazy Quilting, and Stitch Combinations for Crazy Quilting with added stitches and illustrations. Click here to preview and buy. Make a beautiful 8 x 16-inch crazy quilted wall hanging! An introduction to crazy quilting, this artful form of quilting is presented with a small project. Color choices are simplified and full size patch patterns are provided so you can focus on creating fabulous seam embroidery and embellishments. Suitable for beginners to crazy quilting. Click here for the EGA course White on White Wallpiece. You’ve dabbled in it, have tried a few things, and may be wondering how to get to a more artful place with it! 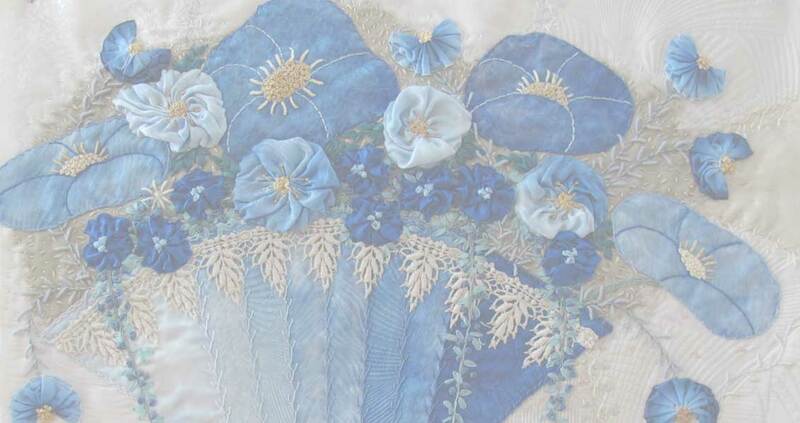 Designed for the intermediate-advanced level student, the course begins with a brief history, then seeks to promote experimentation with embellishment and embroidery techniques. You will work on a 12-inch square block, using a variety of needlework techniques to create a one-of-a-kind piece. Some knowledge of basic crazy quilting and hand and machine sewing are prerequisites for the course. 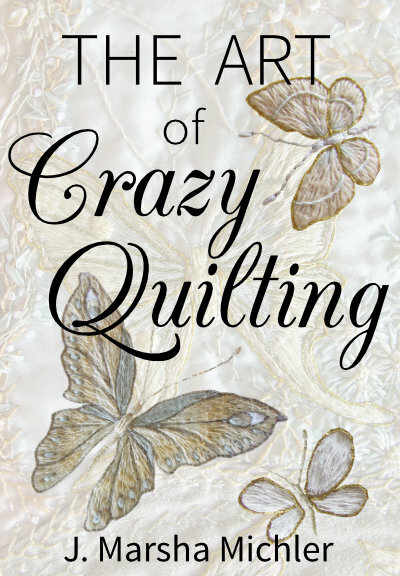 Crazy Quilting, An Individual Correspondence Course is offered through the Embroiderers’ Guild of America. Click here for the EGA course Crazy Quilting. 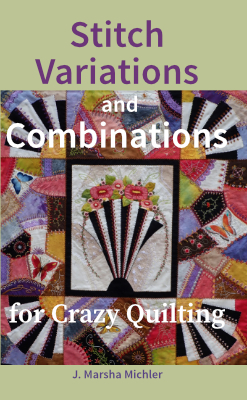 A volume of inspiration, NOT a how-to book… Crazy quilting is an artful process; no two crazy quilts can ever be alike. Creativity is a part of every aspect of the making, each quilter bringing a unique signature to each step. Detail photos of the author's own quilts. 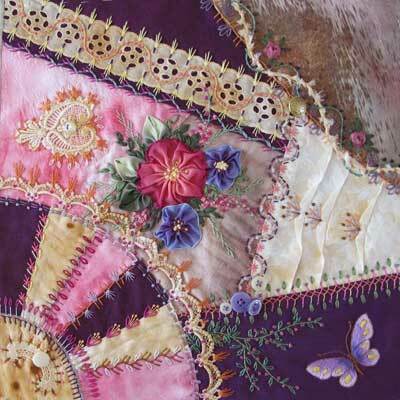 Learn the easy, intuitive, and artful Antique method of patching a crazy quilt. Learn creative ideas for making patches, and how different styles of patching affect design. Piece a fan with accuracy, add trims, and create a beautiful background for further work. Embellishment and embroidery methods are not included in this tutorial. The beauty and charm of crazy quilts is in the variations and combinations of embroidery stitches worked on them. 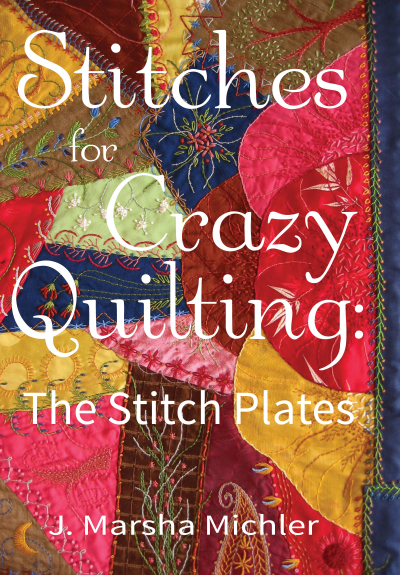 20 hand-drawn Stitch Plates with hundreds of stitch variations that first appeared in the book, The Magic of Crazy Quilting. Instructions are included for the 20 stitches. Learn the art of transforming simple stitches into fabulous seam treatments. 13 basic stitches, lefthand versions, more than 100 stitch variations. 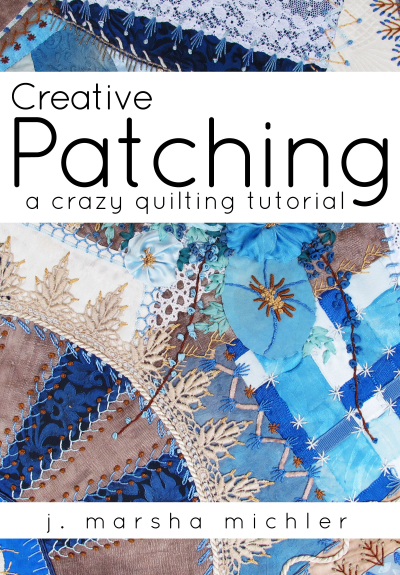 Use variations of stitches to make your crazy quilt truly special, turning a project into an extraordinary work of art! 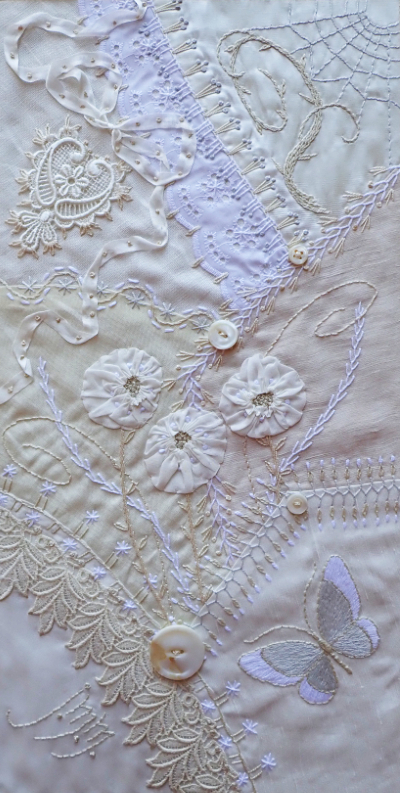 Learn how to combine embroidery stitches for beautiful seam treatments for crazy quilting. Presented are techniques that you can readily apply to create your very own unique seam rows. 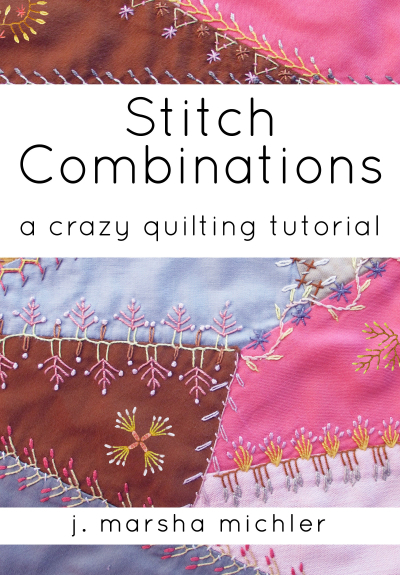 Eight methods for combining stitches, stitch how-to's, and over 120 stitch combinations in full color. The elegant art of silk ribbon embroidery is easy and quick to do, and stunning results are within the reach of any stitcher. 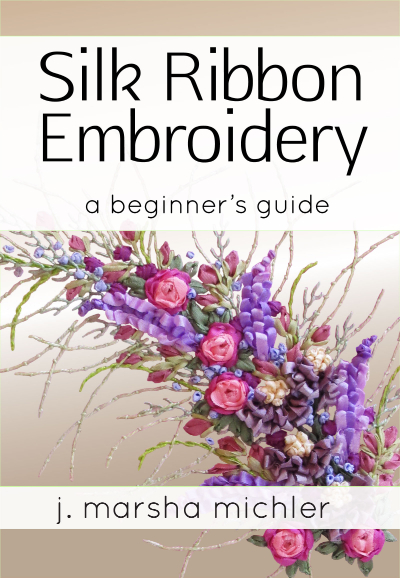 Includes stitches for ribbon work, sewn florals, bias ribbons, and how to easily dye silk ribbons. Includes a tutorial for a motif. The beauty of silk ribbon embroidery is in how stitches effortlessly take on the shapes of flowers and leaves. Nineteen silk ribbon stitches. Embroider flowers, foliage, arrangements, weave a basket, create unique and beautiful designs. Some basic stitches, simple tools and materials are all it takes to get started with embroidery. Covers tools, threads, fabrics, transfer method, ideas for designs. Three ways to stitch a motif. Seventeen basic embroidery stitches with lefthand versions. 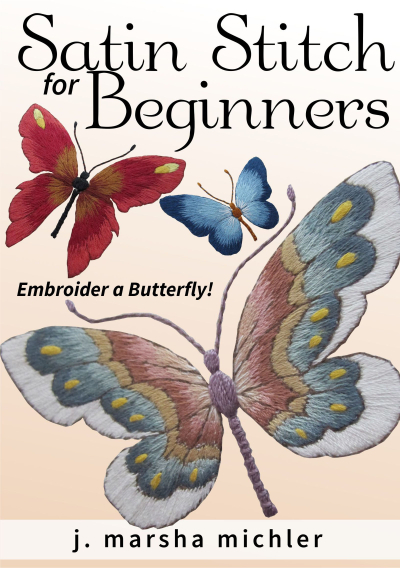 Teaches beginner-level satin stitching; flat and dimensional, and plain and shaded (also called “thread painting”). Includes Plain Satin, “Thrifty” Satin, Padded Satin, Long and Short Stitch, Beetle Stitch, outlining stitches. Stitch a butterfly! 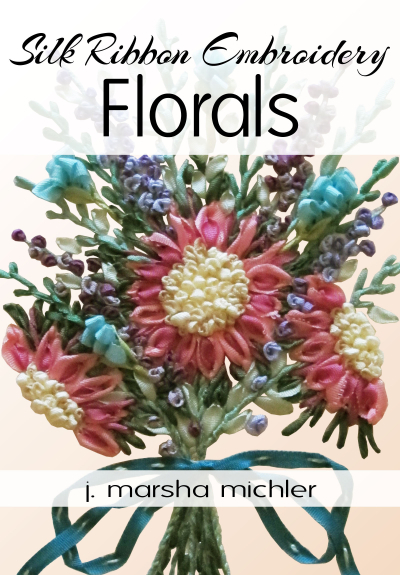 J. Marsha Michler has authored 14 printed books on the topics of crazy quilting, jewelry, knitting, and needlearts, and 9 ebooks on crazy quilting, embroidery, and silk ribbon embroidery. She has written many articles for magazines and has won awards for her crazy quilts. 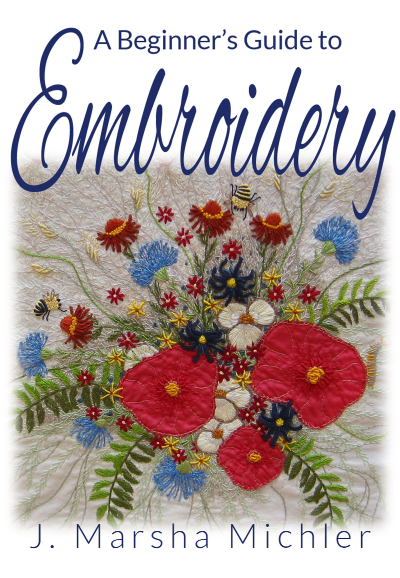 She currently teaches crazy quilting through correspondence courses offered by the Embroiderers' Guild of America. Crazy quilting, embroidery, fiber spinning, knitting, fiction and poetry writing keep her busy, and in her spare time she gardens, builds stone walls, and enjoys ballroom dancing and travel. She resides creatively in the beautiful foothills of Southern Maine with her husband and cat. Please join her on facebook to find photo albums of her quilts and needle works.